Soundbytes BagPipes - der VST Dudelsack mit sechs unterschiedlichen Sackpfeifen aus verschiedenen Europ�ischen Traditionen. 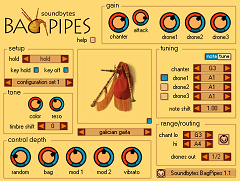 The Soundbytes HurdyGurdy is a sample based VST synthesizer for the windows platform. It faithfully recreates the sound and playing technique of the ancient Hurdy Gurdy. The Soundbytes Sympathizer is a new and versatile audio effect. It is based on a tunable comb filter bank and extends the concept to further explore this very specific and rewarding domain of sound creation. The monophonic Soundbytes OBBO Synthesizer offers a new way to creating a realistic emulation of the sound of the classical oboe.